Happy New Year! Hope your holiday season was a great one! As I sit and write this post, the weather outside is perfect! Gorgeously sunny, near 0°c (32°f). It is hard for me to keep my focus on work today. I keep thinking about strapping on the cross-country skis and going for a quick ski along the snow covered paths for a quick workout. During our holiday break, I was able to head out for a two-day snowshoe hike along the Bruce Trail. As a landscape architect, I enjoy spending as much time in the landscape as possible, both urban and natural spaces. It is where I keep myself healthy: It reduces my blood pressure and stress levels. Nature provides for our needs if you know where to look. I always find hiking and being in nature recalibrating and can’t wait for the next trip! On a recent outing, one of my great friends, Eric Chagnon of Get Outside Fitness, showed me how to use the surrounding parks and natural areas as fitness centres. 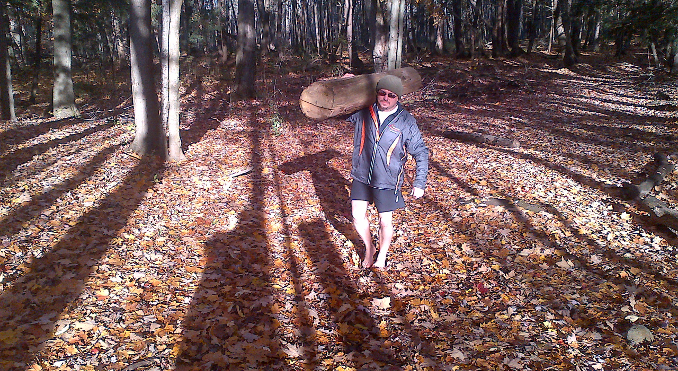 There are so many great exercises one can do on a basic large rock or log, placed along or near a trail. Exercises such as step ups, planks, push ups, tricep dips, balancing and even crawling just to name a few. There are cost advantage to using natural objects like rocks and logs in both installation and maintenance compared to manufactured equipment. The natural elements can be integrated into natural parks without looking out of place. As an added bonus, the workout stations can also double as a rest stop bench at scenic lookouts or is it the other way around? The design possibilities are endless and they can be easily placed along existing trails or designed as a part of a new trail system or addition. As a design team, Eric and I can work with your parks facility staff, and stakeholders to design a great natural fitness trail within your park and budgets. We can design the trail for a wide variety of skill levels while engaging the whole family to improve their health, and help to increase positive users within your parks. We look forward to the opportunity of creating a great fitness trail for your park. If you have any questions or would like to know more, please feel free to email me at kevin@beyondthepost.com or phone 226-339-1899. Sign up for our newsletter for more tips regarding all aspects of the landscape from site plan approval process for new developments, trail design tips through to maintenance tips and thought-provoking commentaries like this post. I appreciate your time in reading this post and look forward to your comments, and questions. I always thought of Monarch Woods in Kitchener as the Rocky IV outdoor fitness centre. I guess I was right. Eric of Get Outside Fitness can show you the ways! He is a great coach.